Such a morning treat to see a post notice in my inbox. Have you posted / have I commented since moving from New Mexico to Colorado? Much to catch up. I should email you (way behind there too). Just thinking about you too since another since Sarah Honeychurch, another mooc-met Scot sent me a slightly darker than heather colored knit cap — rhizome pattern. 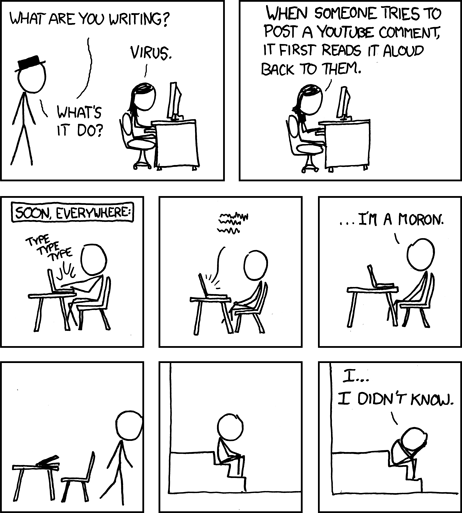 I’ve been collecting articles on commenting. Alas, our recent election has not done much to further civilized commenting. Debate vs support is interesting distinction — leads me wonder about age/generation divides and professions. Good to hear from you Vanessa. I’ve been preoccupied with nerdy stuff to blog or tweet much, not to mention a USA tour during the summer – visited Los Angeles, Crand Canyon, Las Vegas, San Francisco etc. Yes you’ve commented since your move but do email if you get the chance. As for the US election, everyone here is bewildered but I did learn a new word: ‘Kakistocracy’ – government by the least qualified or worst persons!